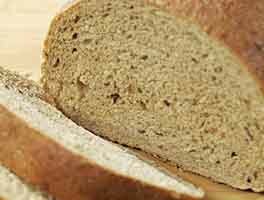 Are you a devoted rye bread baker looking to develop a rye starter for your sourdough rye recipes? Here's a simple way to turn some of the discard from your current sourdough starter into a rye starter you can maintain and use for all your rye baking needs. For the first feeding: Combine the 1/4 cup starter with 1/4 cup room-temperature water and a heaping 1/2 cup pumpernickel flour (organic preferred). Place the starter in a nonreactive container. Sprinkle a light coating of pumpernickel flour over the top of the starter and cover it. Allow the starter to rise for 12 hours at room temperature (70°F). For the second feeding: Keep 1/4 cup of your initial starter, the one you made 12 hours earlier; discard or give away the rest. Feed the 1/4 cup starter with 1/4 cup room-temperature water and a heaping 1/2 cup pumpernickel flour. Sprinkle the top of the starter with pumpernickel flour and cover it. Allow the starter to rise for 12 hours at room temperature. Repeat feedings as above until the starter is rising well and has a pleasantly tangy odor. The more feedings you give it the better, as it takes a few days for the starter to completely establish itself as a rye starter. Once the starter is rising well, you can refrigerate it for up to a week before feeding it again. 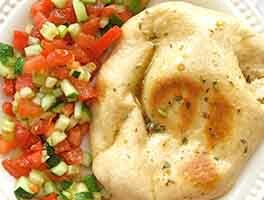 Feed your starter as above and allow it to sit out at room temperature for 2 hours before returning to the fridge. If your rye starter has been stored in the refrigerator, be sure to give it two or three feedings at room temperature (morning and evening) before you plan to use it in a recipe. 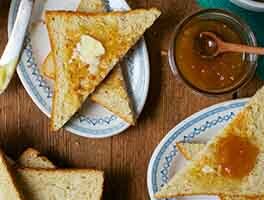 This will revive it and help achieve optimum rise and flavor in your bread. Add your rye starter to a recipe after it's been fed and isn't quite doubled in size. It will be domed on top, with islands of rye flour surrounded by cracks and crevices. This will likely take about 8 hours at 70°F, but everyone's starter will be a little different. 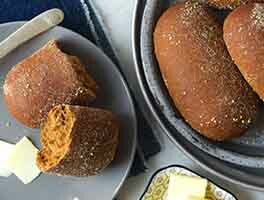 You can substitute medium rye flour for pumpernickel, but pumpernickel flour is preferable. The starter will likely ferment more quickly with medium rye flour because it'll be wetter. If you've made Jewish Rye Bread you can use the remaining rounded tablespoon of rye sour in place of the 1/4 cup of unfed sourdough starter in the first feeding, then proceed as above. 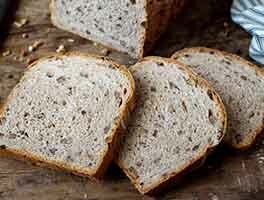 Is it possible to substitute some white flour for some pumpernickel flour to make a lighter bread? Big John from Tacoma, Wa. My starter formed a crust on it. Kind of hard. Should I leave it in my started or discard it. I tried to stir it in but no success. Any tips? Like several others my first batch was more like a sticky soft dough than a batter but the next day it when I went to feed it, it was light and frothy with lots of bubbles. 7 days later I am baking my first 2 loaves. If you are positive that you measured correctly then have faith and keep feeding it. Because of the beginning texture I started 2 other starters one from the web and one from an old cookbook. By day 4 the other two had failed but the King Arthur was just bubbling alone. After two weeks of trying to get a regular sourdough starter going with no success (and a whole lot of flour used for naught), I tried this rye starter recipe and it came alive in hours. Fed it twice just to be sure, and now I have a dough proving for baking later. So glad I came across this one! Thank-you for this recipe. It's working great for my weekly Rye bread. If i wanted one for whole wheat bread besides the white flour one would I follow the sameinstructions as for this Rye starter? Thanks so much! I would like to try the Jewish Rye Bread, but I am starting from complete scratch in terms of starter. 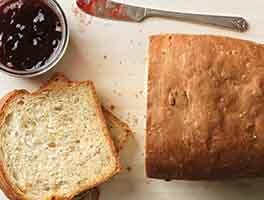 Is there some way for me to combine the process of the main "Sourdough Starter" recipe with this recipe? Could I follow the main Sourdough Starter recipe but use only rye flour in the feedings and then be good to go about day 5? Can you recommend a recipe for using this start? Or, can this starter be used in any other recipes requiring sourdough starter? I converted portion my starter to pumpernickel it took off like crazy. I used it in Jeffery's black bread and achieved the same great flavor but in less time than the stiff starter I've been maintaining. I'm not sure why the flour on top? The consistency of my starter is already fairly stiff. I only have access locally to small mill stone ground so it isn't as fine of a grind.